Stay fashown at all costs! The holidays are probably the best reason to go shopping. At every bend, there’s a party to attend and a gift to be bought, and that means, a budget to be managed. The only thing worse than breaking the bank for a big ticket purchase is actually going broke. But fear not, we’ve searched the mall for the perfect gift guide that can fit any fashionista’s budget. Herewith, our Christmas finds at every price point. Gray beanie, P795; gray onesie, P695; kids' navy flats, P995; gray leggings with hearts, P695; pink leggings, P795; and women's tank top, P895. Even the most frugal spenders can find something in Gap. The comfiest basics are a fitting foundation for every wardrobe. For the little ones, who can resist gifting their favorite godchild an I heart daddy onesie or tiny flats with secure ankle straps? Hoodie, P1,850; denim dress, P1,850; tote bag, P 1,750; plaid scarf, P1,850; flip flops, P1,450; teens' khakis, P1,850; and teen's jeans, P1,950. 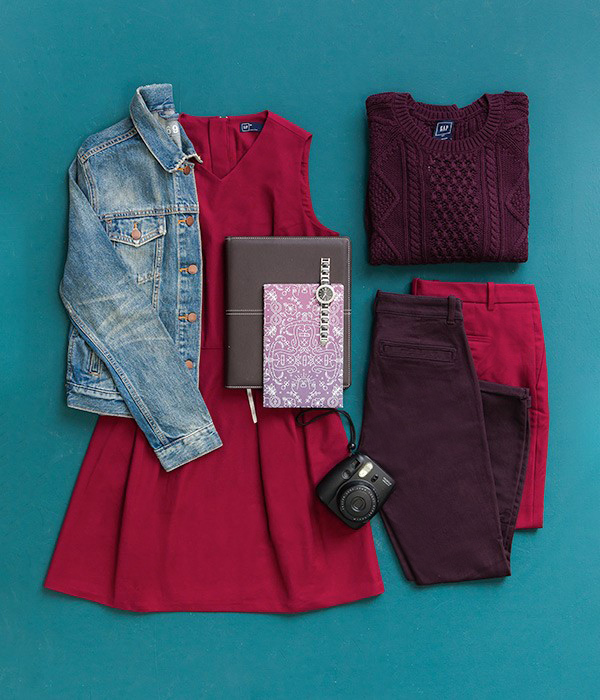 Make sure your gift lasts a lifetime with staples that don’t go out of style. A denim dress is a classic. So are hoodies! Your favorite cousins will certainly love these presents. For friends who love spending lazy weekends out of town, get them some travel staples, such as khakis, comfy flipflops, a scarf with a nice print, or even a chic white tote. Longsleeve sweater, P2,650; button-down, P2,650; leather belt, P2,2560; joggers with zip details, P2,750; gold bag with tassel, P2,450; and pleated skirt, P2,950. 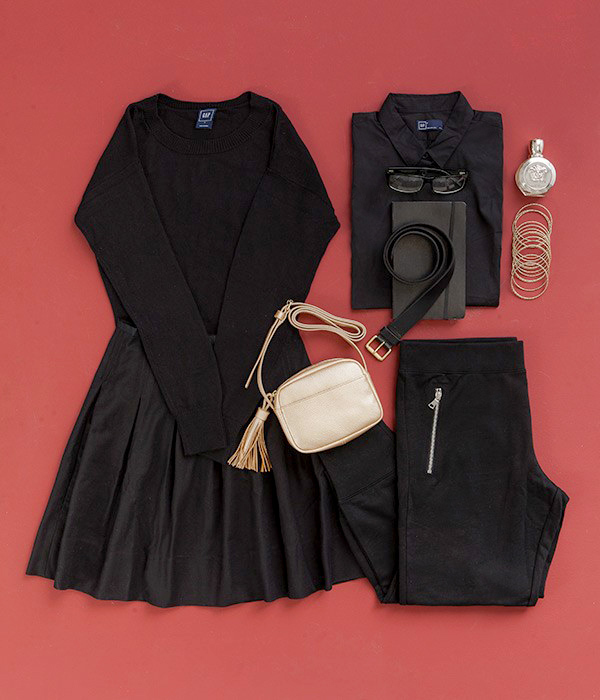 Metallics are the perfect accent to add cheer to an all-black wardrobe. A monochromatic sweater-and-skirt combo doesn't look drab with touch of gold, while joggers with metal zips are a little reminiscent of the days Stefano Pilati did moto pants for YSL, no? It works for different friends with different styles. Now to decide who to gift what! Denim jacket, P3,950; red dress, P3,650; burgundy cable knit, P3,250; garnet cropped pants, P3,250; and burgundy skinny jeans with zips, P3,250. A rich red hue is the first thing that comes to mind when talking about Christmas. Natch, a burgundy cable knit would make the perfect sense! Same goes for a sweet V-neck red dress. Besides, even those who don't do color always do denim and oxblood. Trench coat, P6.950; black polka dot dress, P4,250; men's jacket, P6,250; women’s real straight dark denims, P4,250; and men's lightwash straight distressed denims, P4,550. Save the biggest gift for yourself. Or hide it under the perfect excuse of not wanting to let the cold cramp your style. 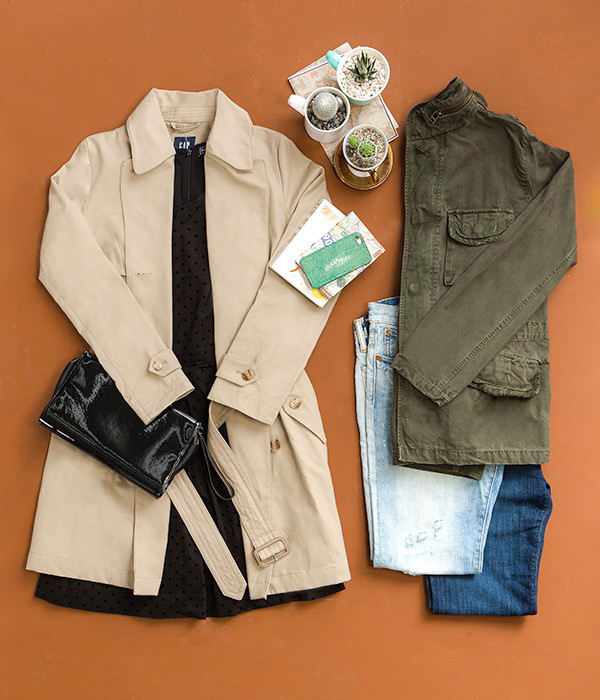 Opt for an olive parka and jeans on lazy days and a trench when you want to feel like you’re in Casablanca during your winter getaway. Now to look for a gin joint to walk into in this city. Shop these and other finds from the Gap Holiday 2015 Collection. Visit any of the Gap stores at Glorietta 4, Shangri-La Plaza, SM Mall of Asia, Trinoma Mall, Bonifacio Global City, Alabang Town Center, SM Megamall, Robinsons Magnolia, Eastwood Mall, Fairview Terraces, Estancia Mall, Abreeza Mall in Davao, and Ayala Center Cebu. This article was created by Summit StoryLabs in partnership with GAP.